Do you have a passion for colour, fashion and a desire to help people develop their potential? Are you energetic, enthusiastic, self-motivated and organised? Are you interested in knowledge that is different from other training providers? Would you like to learn more about colour in a creative, mindful and philosophical way? Our objective is to train personal stylists to a very high standard, with the principles and skills that you will need for a successful career. Each stylist will be taught the skills to become a Colour and/or Style Consultant with a difference. This comprehensive training is presented in modules and can be tailor-made to each personal requirements. 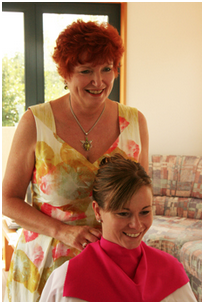 Chryssie Woodham, Director of Unique Style has an engaging style of training which reflects her 30 years experience. Her philosophy that everyone is a unique individual is the basis of her heart centered training and is reflected in her expertise on showing you how to help others to develop a style that is uniquely theirs. How to utilize colour in a way that supports, uplifts and harmonizes with people on all levels of their being. You will be shown how to use her 4 principle dressing system which has a 100% success rate when used effectively. Each stylist can choose to benefit from ongoing mentoring in business building, marketing, communication and sales skills. She will be there to guide you step-by- step as you turn your dream career into a reality, provide expert advice on starting and running a successful business, and can also provide ongoing support throughout your career. This is not a franchise and you can decide what parts of the training that you require, for instance you may already be a Colour Consultant and wish to add style and wardrobe planning to your services; or you may wish to add Colour Consultancy to your existing beauty or fashion service. There are many different motivations to work in this industry and the skills taught can enhance what you already know or start fresh. You may like to add another service to your exisiting business - hairdressing, beauty therapy, makeup artist, personal trainer, life coach, fashion designer, personal branding coach, corporate image consultant, model agency or fashion retail. You will learn her 4 principle dressing system that takes creating a unique style to another level. Clients will be amazed at how they feel when they fully embrace their dressing style - expressing themselves authentically. You will be taken through it yourself to fully understand how it will be liberating for your own clients. WE teach you how to promote self confidence and positive body image. Each module will include business planning, marketing, communication and sales skills to help launch and build your burgeoning career. You can opt to have ongoing mentoring with Chryssie so you can feel that you have someone to talk to each step of the way. New - 5 day Colour & Training module - this is a course that covers all aspects of starting your career as a personal stylist or can be tailored to the Fashion Retail Style module. This will cover all the theory of colour and how to determine whether your client is warm or cool, and how to wear colour on the body, and much more. It is designed as a introductory course which you can upgrade to a full colour consultancy diploma in the future. "Hi Chryssie. I just wanted to say a huge thank-you for everything you have done for me.I know I was potentially a really tricky student for you since I had already completed a course in Colour Consulting and Personal Styling in the past, however you were still keen to take me on and adjust your mentoring style to reflect my many needs. In particular I was really impressed with your knowledge of colour and how it changes people in a positive way for each individual. I really love the colour system you have developed because it is so logical and easy to use. It has given me confidence and I feel much happier using this virtually fool proof method. Needless to say my clients are happy with the results too! I also just wanted to say I was really impressed with the 4 step personal shopping system as well because its easy to use for stylists and clients alike. I really enjoyed learning the technique you taught me on how to help a client identify their own personal style based on their personality and personal preferences . It's so subtly simple yet so powerful. There is nothing I like more than seeing a client's eyes light up when they have that 'ah ha' moment seeing their own style materialize for them; and best of all comprehend why it is a perfect match for them to express who they truly are! So thank-you so much for your energy, your kindness, your patience ,and unwavering support! I have loved every minute of it." I have been working in the industry for a long time, and mostly on my own, and I know that it is important to have a mentor and expert at hand to guide you, inspire you, be there to coach you, and to keep you on track with your goals. I would be thrilled to offer you a no obligation complimentary 30-60 minute stylist coaching session by phone, Skype, or in person if geographically possible. The best way to schedule this is to text me on 0274 407 499 or email chryssie@uniquestyle.co.nz and put 'coach' in the subject line.